One of the most interesting phenomena of the 2016 presidential campaign is how the establishment candidates of the Democratic and Republican parties are proposing what are, in essence, the same programs. First, Hillary Clinton and Jeb Bush endorsed amnesty for illegal aliens, then the Common Core federalization of education, and now “free” college for all. “We ought to be making sure that you can get a four-year degree done in four years. “If kids can’t graduate with a four-year degree in four years, there ought to be some payback to their families or to them, or there ought to be some support for the loans they’ve taken out." It is worth noting (as others have) that Tennessee Promise is the program that Obama cited as the model for his “free” college program. Hillary Clinton’s $350 billion plan starts from much the same premise as Bush’s; colleges should be responsible for paying back loans that graduates can’t repay and suffer other penalties if students don’t achieve what the government decides are “satisfactory outcomes,” taxpayers would increase their contribution to public colleges and universities and subsidies would be given to student borrowers and their families. This is a great Chamber of Commerce “company store” approach to education that assumes the object of an education is produce compliant drones to inhabit cube farms and slave away to repay the debt they incurred to be “educated” to get the job they have to have to repay their debt, but it completely denigrates the idea that the object of an education in a constitutional republic ought to be to learn how to think and to be an engaged citizen. In that sense the idea of “free college,” so long as it produces the right government mandated “outcome,” it is a perfect adjunct to Common Core. History, philosophy, art, music and the classics will be out – no guaranteed payback of the cost of college in those degrees. STEM – science, technology, engineering and mathematics will be in – and paid for, because those will produce plenty of workers to feed the gaping maws of the tech companies that are funding the Bush and Clinton campaigns, and who don’t really want a whole lot of troublemaking liberal arts graduates around asking questions about their tax subsidies and crony government deals. They also get it completely backwards about who should have the “skin in the game” as far as “outcomes,” when they assume the government can figure out which degrees are worthy of subsidy, and let’s face it, that’s what both the Clinton and Bush programs aim to achieve. Neither Clinton nor Bush gets it right, because both assume that, one, a college education is something the government ought to provide to every person who wants one, and two, the government can define a worthy “outcome” from a college education based on the prospect of paying back the cost of the degree. From our perspective the competing Bush and Clinton “free college” plans aren’t really competing for the support of voters who will pay the cost in higher taxes. They are competing for the votes of millennials who made poor choices, and for the votes of their indulgent parents who enabled them and are now stuck with the bill. Most importantly, Bush and Clinton are competing for the support of the same corporate interests who favor Common Core and its focus on producing compliant workers, instead of citizens who have the information and thinking skills to actively participate in the civic life of a republic. 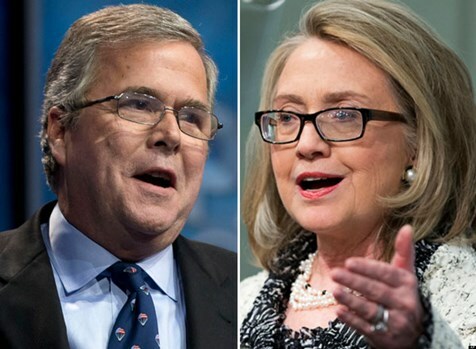 Hillary and Jeb Are they twins? Submitted by ewnorowski1 on Fri, 08/28/2015 - 08:00. Trump needs to ask Jeb about the State of Florida High Speed Rail System Florida Voters wanted. Jeb worked the first four years as Governor to amend what Florida voters thought was a very good idea. All Florida needed to do was guarantee public financing. This rail system would have created thousands of jobs for Florida. Hillary we all know has a very bad memory, when she was investigated for White Water she could not remember. When she was investigated for Travel Gate she could not remember. So, "What does it Matter"
Do not vote for someone with a very bad memory. Submitted by Georuff on Thu, 08/27/2015 - 18:08. The best way to increase the price of something is to subsidize it. When I went to college in 1969, a minimum wage summer job would earn you enough for two semesters at a state sponsored college. The government sponsored student and parent loan programs, and others, were just ramping up then. Try paying for college today with a min wage summer job. So how much will college cost once we taxpayers take over the whole financial responsibility?